n a glittering ceremony, Getenergy Event 2010, held in PETRONAS TOWERS in Kuala Lumpur, Malaysia; Jammu University, Eni (Italian National Oil Company) and University College London bagged the prestigious ‘Education Partnership Award’ in recognition of the promotion of academia-industry partnership between Geology Department, Jammu University, Eni India and Earth Sciences Department (MPRG), University College London. 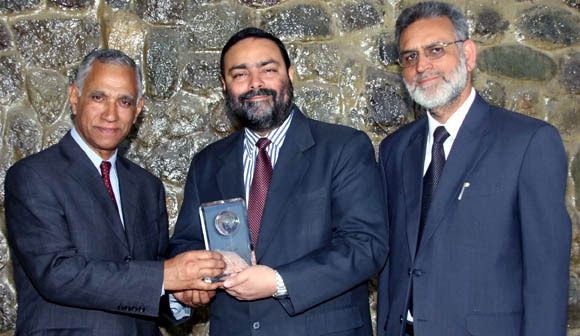 This partnership encompasses geosciences education, research and training in oil and gas exploration; children’s education programme on global warming, climate change and energy efficiency campaign (EEC) and the establishment of the Energy research and training consortium for Jammu and Kashmir State, based at Jammu and Kashmir Universities. The children’s energy efficiency campaign was initiated at Jammu University in collaboration with University College London and Eni in 2008 and was highly appreciated at the award ceremony. This educational outreach activity is now undertaken at a global level and is currently planning the next children’s programme in Ghana, West Africa. Prof. G. M. Bhat of Jammu University; Huma Qazi of Eni, Head of International Human Resources and Dr Bindraban Thusu, University College London represented their respective institutions at the award ceremony in Kuala Lumpur on 23-24 March 2010.